With more enemies set to destroy it than friends to rely on for basic survival, Yemen remains in the throes of a match to the death with its powerful neighbour: the Kingdom of Saudi Arabia. Labelled an enemy by Riyadh on account of its people’s refusal to adopt the kingdom’s political narrative – mainly that the Arabian Peninsula ought to bow to the absolute will of Al Saud royals, this poorest and most unstable nation has known but fire and fury since late March 2015. To put it plainly Yemen is a moratorium – mind you a well engineered one! Cut off from the rest of the world Yemen sits today inaccessible, condemn to wither and die by lead, famine, or pestilence for one king, one family choose to declare it so. Surely genocide warrants condemnation! While we may like to think so, Yemen teaches us that in a world where exceptionalism lies in the hands of those who dare wield it, there are no crimes beyond reach, and certainly few voices to reproach them. When even the most conservative of figures paint a spectacle far beyond the palatable … nevermind the tolerable, one cannot help but recoil in fear. Yemen is no longer an abysmal humanitarian blackhole, it has become the sum of our failures in defending our humanity. If we learn to look upon starving children as necessary casualties of war we might as well throw the proverbial water out of the window, and forfeit our collective rights to morality and justice. Thankfully, and I must say to our great shame, Yemen is not waiting on others for salvation. Rather Yemenis reinvented themselves the architects of a new social set-up, one forged in defiance and resilience. Yes some people simply refuse to quit when the going gets tough. And as far as Yemen goes, tough does not even begin to cover it. But before I get into that, allow me to offer some humanitarian context to Yemen. Speaking to the press in early April, United Nations Secretary General Antonio Guterres plainly depicted Yemen’s suffering as unparalleled and unequalled in its breadth. This is the picture of engineered starvation when wielded as an asymmetrical weapon of war. Next on our list of monstrosities figure pestilence and death by fire and lead. Readers will be asked here to read the word “preventable” as additional proof of Saudi Arabia’s implacable intent to indeed apply their forces against all Yemenis – indiscriminately, to better erode at their collective will to resist foreign aggression. Such tactic mind you carries little originality … History has seen such cruelty many times over. It is that once upon a time, not too long ago we swore we would ‘never again’ tolerate such infamy … and yet here we are, facing the bottomless pit of Saudi Arabia’s tyranny over a nation whose crimes, we were told, needed to be punished before they could manifest. Confused? Saudi Arabia you may care to remember went to war on the basis of an offense that had not yet come to pass. Yemen’s not-then-yet-formed Resistance Movement, it was alleged, posed an existential threat to the kingdom. Which threat of course we never, mere mortals that we are, given further details onto. And why bother when allegations suffice to justify ‘righteous’ wars? Righteousness in those modern days of ours stands with the mighty and the fierce. As for Justice and Sovereignty, they have been politely asked to sit in the back of the class. But what of the systematic and merciless targeting of civilians and civilian infrastructures? If one may argue famine and pestilence as natural causes of war, what to say of the killing of the innocent because of their innocence? 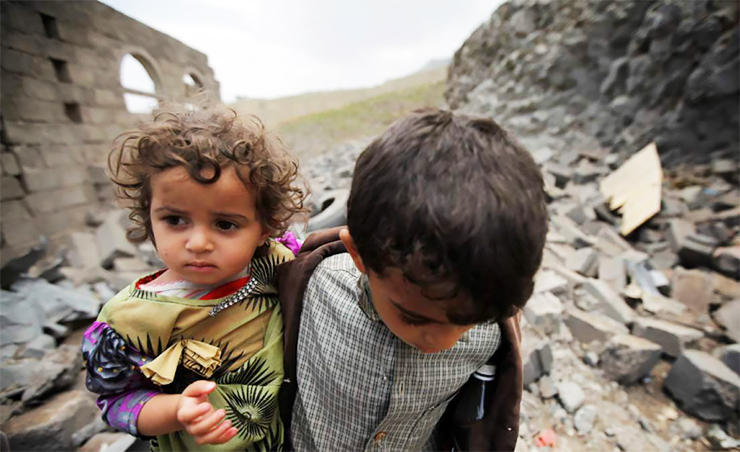 Under such unbearable odds Yemen has refused to give up but an inch. Alone before the military might of several Titans, Yemen has chosen resistance by way of social resilience. Yemen as it were houses a few heroes. And while those heroes may not fit the usual esthetic – they do not bear any weapons and they care little for confrontations or even isolation on the basis of differences; they are saving Yemen more effectively than any grand military act. Yemen today needs saving! And since aid has been denied by the imperious will of geopolitics, it has been left to Yemenis to save themselves from annihilation. And though it may sound counterintuitive for the destitute and the downtrodden to master the will and resources to help others, nevermind themselves, their collective will to stand together or not at all, has allowed for such feat. Several charities and NGOs, among which most active of all the Foundation for Knowledge and Work, have stepped up to fill Yemen’s socio-economic gap, allowing for people to not only heal from the trauma of war but gain new skills to overcome financial hardship. Based on social empowerment through learning, as opposed to to handouts, the NGO is catering for an increasing number of families every month. Most striking of all the NGO has worked extensively with trauma victims and IDPs so that they could be reintegrated into society and regain financial self-sufficiency. And while of course life remains difficult at best due to the pressures of war, Yemenis have found some strength in the realisation that against many and grave odds, hope is still theirs to wield.